Use the Well Markers Table (a classification sheet of well markers) to view and edit the markers and tops in a spreadsheet format. See Defining Well Markers, Managing Well Components and Selecting Default Well Components for more details. The Well Markers Table can be exported as a .csv or .txt file. Insight will export all the markers shown in the table. Note: You can only edit the markers if you are the owner of the active marker set for a specific well. If you are not the owner, you must first take ownership of the active set (see Taking Ownership of Wells), create your own set (see Add a new Marker Table), or choose another marker set to be active (see Import a Marker File). In the Control Panel, go to the View menu. In the Control Panel, open the Well tab and select the intended well. In the Details Panel, under the Markers section, click Open Marker Spreadsheet. Green/Amber circle (Show/Hide All) — At the top left corner, click this to show/hide all the well markers of the visible wells in the section, 3D and well correlation views. Domain Selector — Show marker units in MDKB, TVDSS or TWTSS. 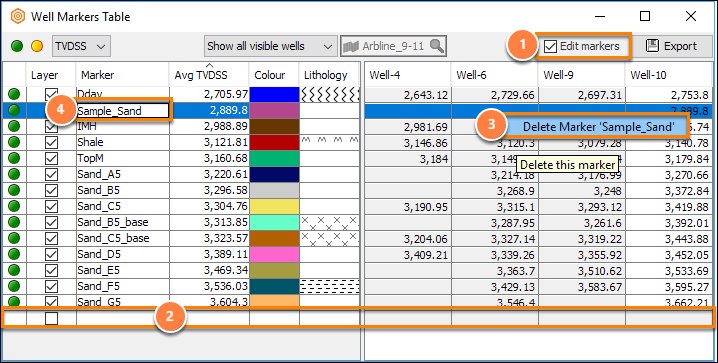 Well Selection — Show well(s) unit value of all visible wells or wells near a selected arbline. Enable Editing — Click the Edit markers check box to create markers and/or edit the marker names and values directly in the Well Markers Table. 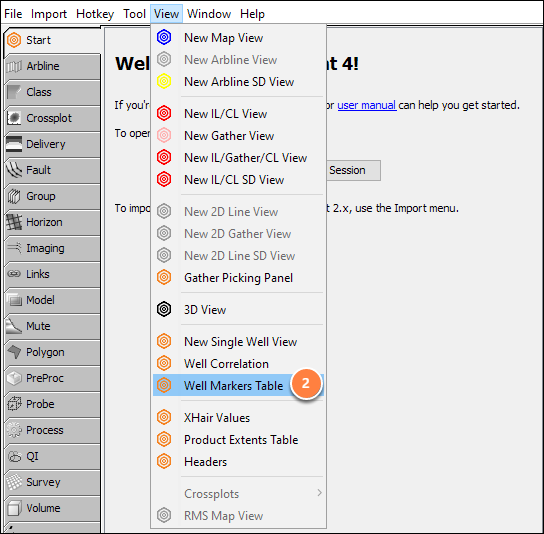 Export — Export the Well Markers Table as a .csv or .txt file. Green/amber circle (Show/Hide) — At a specific row, click this to show/hide the well markers in the section, 3D and well correlation views. Use this feature to view important markers on the wells, especially for wells with many markers. 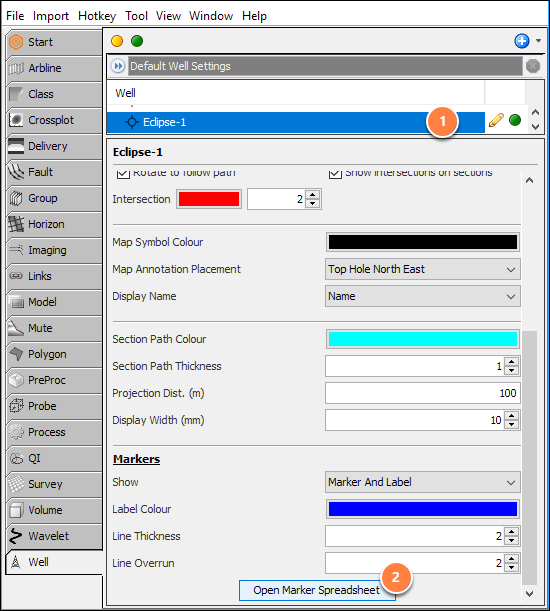 Layer — Select/clear this check box to display/hide specific lithology layers in Well Correlation. You should first display a marker before you can display the corresponding layer that is topped by the well marker. Marker — The name of the well markers. Avg MDKB/TVDSS/TWT — The average MDKB/TVDSS/TWT of the wells for each marker. Colour — Click to change the line colour of well markers in Well Correlation. Assign different colours to differentiate various markers. Lithology — Click to assign colour and/or pattern to represent different lithology formations in Well Correlation. Wells — Markers data for each well. These values come from the marker files of the wells loaded in Insight. To edit the well markers, select the Edit markers check box. Enter the value for each well. Note: You can also create well markers in the Well Correlation View (see Editing Markers (Well Correlation View)) or pick a well marker in Section View (see Picking Well Markers). In the well column, right-click on the marker value and select Delete Marker 'name...'. Edit directly in Section View. The Well Markers Table can be exported as a .csv or .txt file by clicking Export at the top right corner of the window. Insight will export all the markers in the Markers table, regardless of their show/hide status.